Occupying a sub-category of its own, this virtual drum system combines a novel and powerful groove engine with great sounds. Powerful loop creation and editing. Useful Rhythm Generator. Richly varied sample set. Five core sound engines. There's a lot to learn. MIDI implementation is a bit esoteric. Not a traditional virtual drum kit. Prague-based developer MeldaProduction is best known for its extensive roster of deep, powerful effects plugins. However, it's also had a virtual drum kit and drummer-style playback engine on the books for many years now in the shape of MDrummer, recently upgraded to version 5. In typical Melda style, MDrummer (VST/AU for PC/Mac, standalone for Windows) is nothing if not comprehensive, featuring acoustic drums, electronic drums, percussion, and extensive onboard pattern programming and editing. "The core library includes over 1500 samples and 12,000 MIDI loops arranged into over 300 Drumsets"
The core library (over 7GB of losslessly compressed audio) includes over 1500 samples (900 one- shots and 600 used for multisamples) and 12,000 MIDI loops arranged into over 300 Drumsets and 300 genre-categorised Rhythms (collections of song section-specific MIDI loops). Further presets include 2400 Drumset components (kit piece presets that can be loaded into Drumsets) and 200 base rhythms (simple kick/snare loops used for the Rhythm Generator. Also available is the free MDrummer Small for those who want to try before they buy. MDrummer 5 is the fifth generation of an instrument that's grown organically over time, so some of the core features - such as the Rhythm Editor and Rhythm Generator - have been around for ages. Design-wise, it adheres to Melda's house style, which clearly values function over fancy graphics (although there are various alternative skins on offer to alleviate the visual boredom), with the interface spread across seven tabbed screens: Quick Setup, Mixer, Effects, Song, Drumset Editor, Rhythm Editor and Rhythm Generator. MDrummer's overarching remit is the triggering of fully editable drum sounds (Drumsets) by drum patterns (Loops), plus effects processing (including 30 classic Melda processors) and mixing. However, that doesn't really describe the full extent of its capabilities. In terms of sound generation, for example, there are five drum sound sources onboard - MSampler, MMultiSampler, MScratcher, MSubSampleSynthesizer and MSynthesizer 4NN - each including an extensive library of presets. MSampler and MMultiSampler handle single and multisampled sounds respectively, while MScratcher applies a multipoint pitch envelope to single sample files. 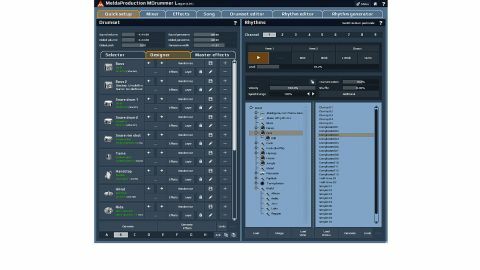 MSubSampleSynthesizer offers "spectral merging across 10-frequency bands" for around 100 pre-prepared samples, while MSynthesizer 4NN is a four-oscillator, two-noise-generator synth. Every element of a Drumset can host as many layered sources as your computer can handle, freely combining all five types. Impressive. On the pattern side of things, each Rhythm preset includes not only a number of section Loops (Intro, Beat, Break, Long Break and Outro) but also multiple variants on each of them. MDrummer maps these across the keyboard, enabling you to 'play' patterns, auto-accompaniment style, and even stack multiple loops on a single key, each with its own velocity range. Once again, undeniably powerful stuff. MDrummer's Rhythm system features nine Rhythm 'channels'. By default, these occupy the first nine MIDI channels, allowing you to load up to nine separate Rhythm presets (each one comprising numerous song sections, remember) and trigger them via their corresponding MIDI channels. Channel 10 defaults to direct triggering of the Drumset components, but you can override this with the 'drum pad mode', whereby all MIDI channels trigger the Drumset components and the Rhythm MIDI channels are disabled. If you prefer to work in more traditional fashion, you can drop individual loops (intro, break, verse beat and so on) of an entire arrangement constructed in MDrummer's Song page into your DAW as MIDI. "Its library is excellent and varied, though, including kits by Gretsch, Sonor, Pearl, Tama and Mapex"
As has hopefully become clear, MDrummer isn't really a virtual drum kit instrument in the same vein as FXpansion BFD3 or Toontrack Superior 2, in that it doesn't give deep control over the sound of a real drum kit via bleed, overheads, room mics and so on - just basic mixing of sounds. Its library is excellent and varied, though, including kits by Gretsch, Sonor, Pearl, Tama and Mapex (some played with brushes and mallets), a variety of electronic and 'urban' sounds, and a collection of typical percussion options. Factor in the synthesised sources and you have an instrument that qualifies as desirable for its library content alone. Overall, the interface works well, with the Quick Setup page serving as a good starting point before you head into the detail pages for more specific editing. MDrummer 5 is also peppered with buttons for 'generating' and 'randomising' new Drumsets, rhythms, effects parameters and so on - great when you're stuck for inspiration. On a similar tip, once you've exhausted the sound library, you can import your own sample sets. Anyone who's used a MeldaProduction plugin will know they never do anything by halves, and MDrummer 5 is no exception. No, the 'functional' interface won't be to everyone's taste, and at times it can be a bit fiddly; but a more graphics-rich design could struggle to accommodate such a huge range of features. As well as the sound library, the Rhythm Generator is particularly worthy of praise, giving you the tools to generate multiple parts quickly and easily - team it with the Rhythm Editor and you have a winning combination for part creation. MDrummer 5 is probably the most complex drum instrument we've used, with a tougher learning curve than most. Nevertheless, getting accustomed to its workflow and foibles rewards the user with a powerful rhythmic tool indeed, and its 'drum machine on steroids' approach will surely appeal to the creatively inclined.